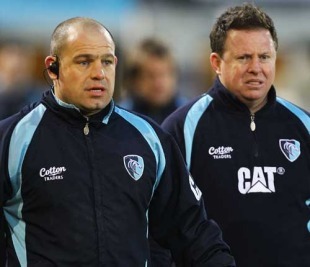 Leicester Tigers have dismissed rumours that their head coach Matt O'Connor is in the frame for the Western Force job. Richard Graham left the Perth franchise back in April to take up a role with the Reds and figures such as John Kirwan and ex-Stade Francais boss Michael Cheika have been linked with the vacancy. O'Connor's - who has been linked with the post in the Australian press - reputation within rugby circles is growing by the second with the Tigers playing a ruthless brand of attacking rugby this term. But Tigers director of rugby Richard Cockerill is adamant that his man will not be leaving Welford Road for Perth. "Matt has not applied for the job and he has no intention of taking it," Cockerill told the Leicester Mercury. "In fact, I have already started discussing the possibility of him extending his contract and staying here for longer." Cockerill's sentiments were echoed by the Tigers chief executive Simon Cohen who said: "Matt O'Connor is an outstanding coach and he is always going to be in demand. He is contracted to us for another season and we would expect him to see out that contract and hopefully beyond."